Do You Need To Aerate Your Kalamazoo Property This Fall? What gets you in the Christmas spirit? Is it the twinkling lights, the festive music, or something else? Personally, a nice warm beach and a decorated palm tree will get me in the Christmas spirit every time! But we can’t all decorate palm trees…especially in Michigan. So, to attract, and get visitors into the Christmas spirit, here are a few simple steps you can take to dress up your Kalamazoo business this holiday season. Simply wrapping a few trees and shrubs can make a big impact on a winter landscape. Some people like to tightly wrap a tree trunk, which can create a really stunning visual effect, making the tree look almost ‘fuzzy’ and touchable from a distance. However, that can require a lot of lights, so you can opt for a simpler trunk wrap. Don’t forget to include some of those smaller shrubs too, especially along the building or walkways. 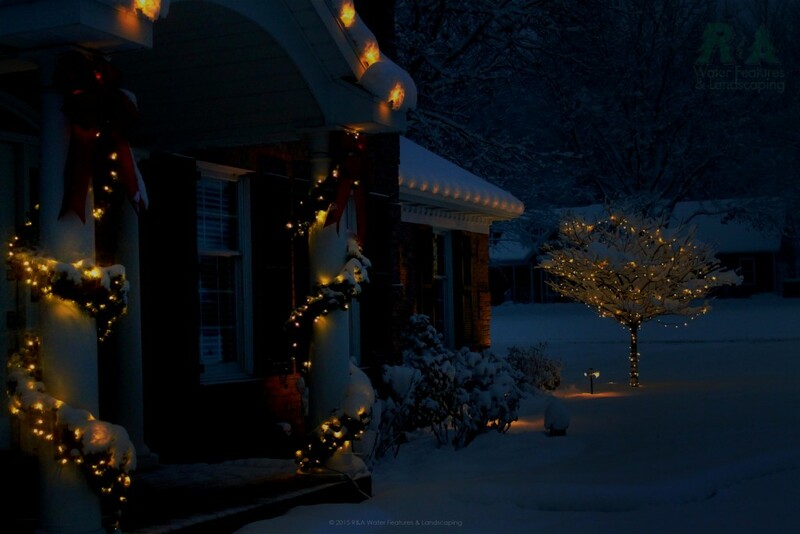 Holiday lighting provides an added element of security, just like regular landscape lighting. 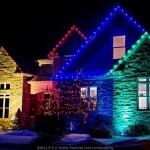 There are no rules when it comes to adding Christmas lights to your Kalamazoo home or business, so add some color! Or, add some warm white if you only have color. If you typically use white for roof lines, wrap a few trees or shrubs in red, or wrap some columns with blue, or even try a golden color for a focal point. Green is always a lovely sight in winter, so having greenery in your Christmas decoration display can be an important factor to consider. Whether you enjoy fresh greenery or prefer artificial greenery, a great way to incorporate it into your Kalamazoo holiday decoration display is to add a wreath, a column drop, or some lighted garland along a railing. Any added greenery will often add that extra element that many other holiday decoration displays are missing. It’s always a good idea to get some trusted advice on your Christmas lighting display in Kalamazoo, and better yet if that company can install, maintain, and take down your display. 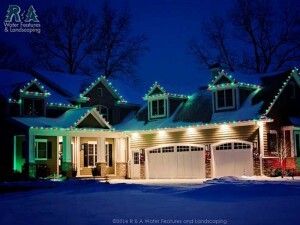 Make sure the company you chose has experience with holiday lighting and are qualified to work on your project. You can get a general idea of this by checking out some photos of previous holiday decoration displays. But always make sure the company you have in mind can provide everything you want. Another note of advice, keep it simple, no need to over complicate or out decorate your neighbor (although that can be quite fun too!). A simpler Christmas lighting display can often have a more effective appeal, less can always be more. R&A Water Features & Landscaping has years of experience, in Kalamazoo and Grand Rapids, using high-quality products on every project, and will make sure that your needs are met during the design, installation, maintenance, and removal of your holiday lighting. Contact us today to get started on your Kalamazoo holiday decoration display!